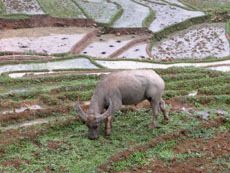 Location: It is about 12 kilometers from Sapa. 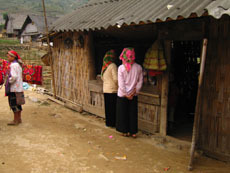 Ta Phin is a picturesque village. 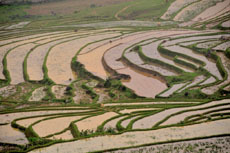 It takes about thirty minute driving from North of Sapa. 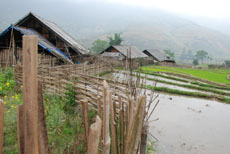 Setting within a valley with a mountain peak at one end, this village is alive with the daily life of the Kinh, Red Dao and Black Hmong people.The valley floor is layered with rice paddies and dotted with 20 small home communes. Above them are some smaller communes and a patchwork of corn and vegetable fields. There are a lot of special things awaiting visitors at Ta Phin. 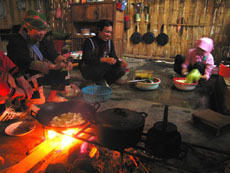 The villagers will invite visitors to visit their homes to show how they live and what they have, and tell about their families. 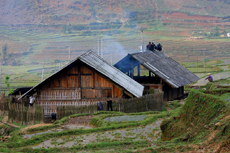 People here are so active – not only do they grow vegetables and pigs and get wood for the fire, they also try to learn English so they can talk to tourists. Before there they’re tourists they they’re very poor. 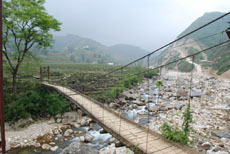 But now they can make more handicrafts and make some money and meet people. 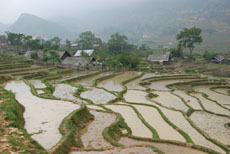 When heading off to Ta Phin village from Sapa, hiking up and down the 12 kilometers of hilly terrain is a good choice as travelers will see local people working in terraced paddy fields, or traveling back and forth from the market to their homes or tourist can stop to see an old French monastery. Especially after a long day of walking on the windy roads and hills around Sapa town tourist can soak your bones and muscles in a traditional Red Dao herbal bath at Ta Phin.